In a note sent out to iTunes Connect members on Wednesday, Apple announced an imminent prices increase for Canada, Norway and all countries in the European Union, as well as an undisclosed change in app cost for Russian customers. 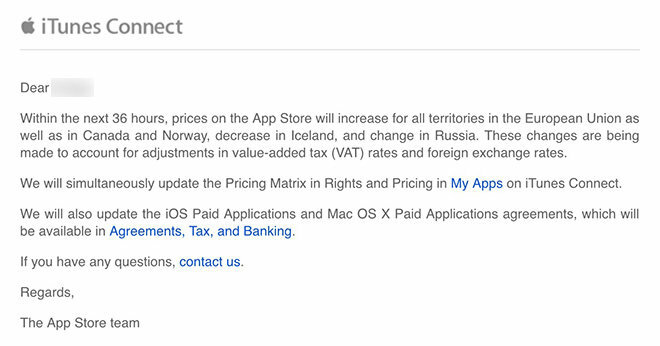 According to the notification sent out by Apple's App Store team, provided to AppleInsider by reader Gregg, prices on the company's digital storefront will be increased in the EU, Canada, and Norway, while customers in Iceland are set to see a decrease. Russia will also receive price changes, though Apple failed to provide detail on the matter. Modifications will take effect within 36 hours, the note said. Apple is making the adjustments to account for localized value-added tax (VAT) changes and foreign exchange rates. While not specifically mentioned in the letter, Apple could be acclimating App Store prices to recent currency fluctuations, while at the same time buffering against what is expected to be a volatile month for the euro. As for Russia's impending "change," it's not clear what to expect, though an unstable ruble did cause Apple to suspend online hardware sales last month. When operations resumed six days later, prices for popular items like the iPhone and iPad reflected major hikes of up to 35 percent. AppleInsider reported in December that Apple would shift its App Store price model away from a flat rate for EU locales on Jan. 1, meaning customers now have to pay fees based on their country of residence.